After a week of recovery from the regular season and catching up on studies and preparation for final exams, the MHC cycling team is ramping it up for our trip to nationals in Madison, WI, on May 7-9. The team raced at Wednesday’s Ring of Fire training race and a few will partake in races this weekend at USA Crits Speedweek. Plus, they’ve been spending plenty of time in the aero bars preparing for the Team Time Trial event on the last day of nationals. Unfortunately, MHC’s graduation takes place on the same weekend as nationals, so we will be without one rider, Melissa Holloway, for the Road Race and Criterium. But after Melissa walks next Saturday, we are putting her on a plane so she can race in the Team Time Trial on Sunday. As you can tell from the photo, Melissa is excited to end her career at MHC on a high note. The team will leave next Wednesday to arrive in time for Thursday evening’s important rider and team meeting and to pick up rider packages. Then the men will kick off the racing on Friday morning at 8:30am for a 72-mile road race that includes over 8,000ft of climbing, a course ideally suited to Matt Willing, where he will have the support of the rest of the team, including Francisco Fuster who is coming into good form and the ever-ready Paul Webb. Then the women will race one lap less on the same course for a total of 58 miles at about 1pm. On Saturday, the racing moves to a flat, fast , four corner criterium course of about 1km. The women will race for 45 minutes starting at 3pm and all around strong woman Klara Rossouw and sprinter Yolanda Colon have a great shot at this event, and then the men will race for 60 minutes starting at 5pm, and MHC will look to set up Paul Webb and Kyle Knott for breakaways and/or a field sprint. Nikola Milanovic will also be in the mix, looking to help the team improve on his strong 15th place at last year’s nationals criterium championship. On Sunday, MHC will field teams for the final event, the Team Time Trial. Then we will start the long drive back home, hopefully with some additional hardward, and perhaps even with a stars and stripes jersey or two. You never know: it’s bike racing, and nearly anything can happen, but we’ve got the talent and momentum to put MHC on the podium. Stay tuned for updates during nationals, which will be posted on our Facebook page. Come out and help the MHC Cycling team celebrate a successful road season. We’ll be rocking out to Johnson’s Crossroad and Cagney Guest next Tuesday at Jack of the Wood in downtown Asheville. A $5 donation at the door will help cover the cycling team’s expenses in traveling up to Madison, WI, for the Collegiate National Cycling Championships. Paul Christopher came out and took some great photos at the Road Race and Team Time Trial. Photos will be further color enhanced and proofed once ordered. The link to Paul’s site is HERE. You can contact Paul through his site if you have questions about pictures and ordering. Thanks for coming out, Paul! 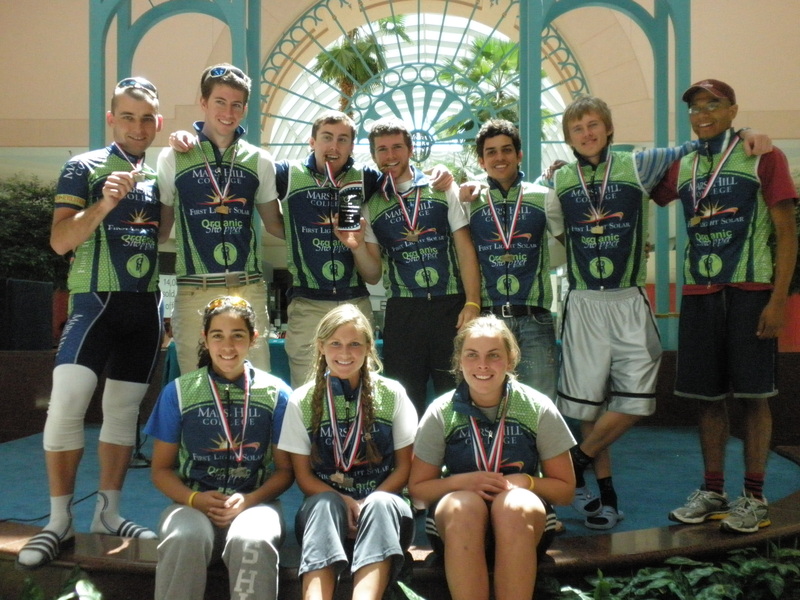 The Southeastern Conference ended this weekend with MHC Cycling atop the podium. The team won the overall team title in Division II ahead of King College and Brevard College. MHC’s Klara Rossouw held on to her lead, winning the overall individual women’s title (Division’s I and II combined) over Lees-McRae’s Rachel Warner, who came on strong during the final weekend by winning both the Road Race and Criterium but ended up just 31 points shy of the lead. Cinthia Lehner rode to a strong 3rd overall finish. Yolanda Colon’s consistent efforts in support of Rossouw and the team earned her enough points to place 3rd overall in Div II. In the men’s individual competition, Paul Webb fought to hang on to his overall lead heading into the weekend but was passed by Clemson’s Ben Zawacki and had to settle for 2nd overall with Zach Felpel in 3rd. Still, Webb claimed 1st overall individual in the Div II rankings, meaning that MHC swept the top podium spots in our Division II. Kyle Knott was 2nd overall in Div II and Matt Willing placed 5th. Both Nikola Milanovic and Francisco Fuster sacrificed their personal chances all season long in order to help the team. Without their efforts, we may not have earned the right to take all of our team to the national championships in Madison, WI, on May 7-9. Other strong results include Melissa Holloway’s 1st place in the Conference Championship Road Race and 2nd in the Criterium (women B). Melissa is graduating this year and is going out on a high note. She will be joining Yolanda Colon and Klara Rossouw in the women’s Team Time Trial event at nationals, a well-deserved ending to her 3-year stint with the team. Also, Matt Willing had a very strong ride in the Conference Road Race, finishing 5th; Ryan Levander rode to a fine 7th in the Criterium; Yonatan Arnold crashed hard in the Road Race and broke his bike but returned battered and bruised to finish the Criterium; and Aaron Wells, the team’s newest member, finished both the Road Race and Criterium, his first bike races ever. 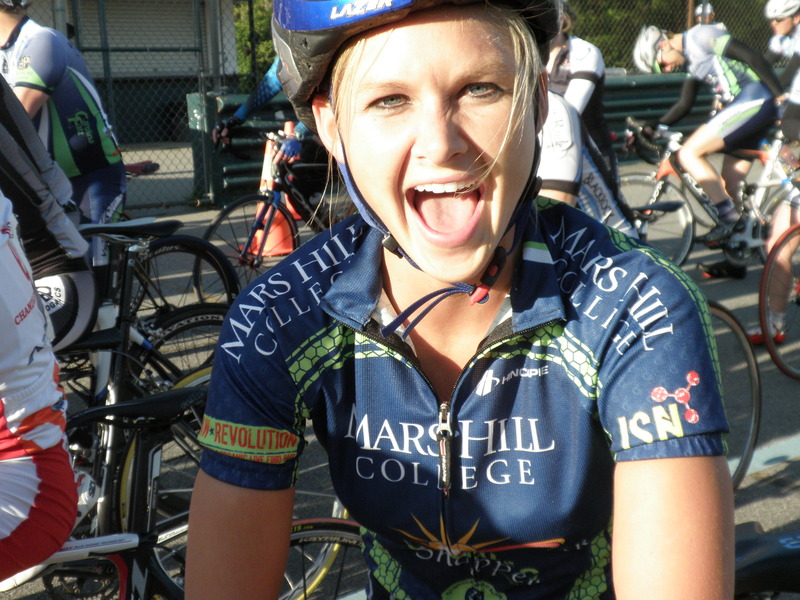 Thanks to Mars Hill College for supporting the team and seeing the value in collegiate cycling. And much thanks to MHC, and our many sponsors, supporters, and volunteers who made our Conference Championships event such a great success. 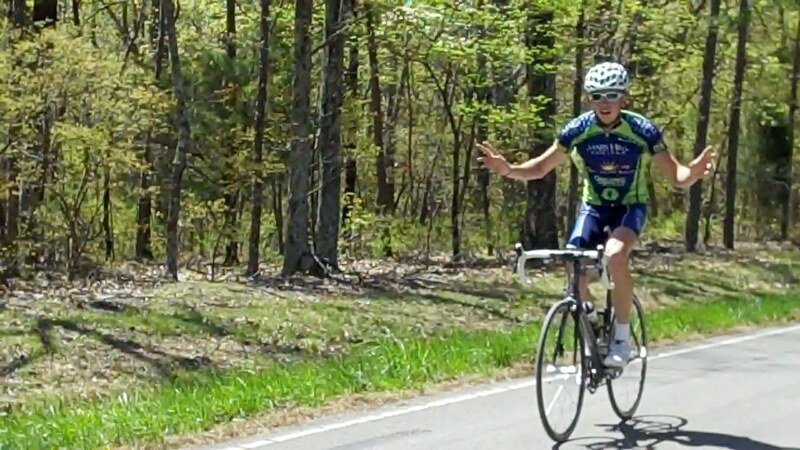 Mars Hill College will host the 2010 Southeastern Conference Collegiate Cycling Championships this weekend. Matt Willing has been waiting all season long for the road to turn uphill and it finally did in a dramatic fashion at the end of University of Alabama-Huntsville’s road race last Saturday. The 73-mile men’s road race finished up a 1.5 mile climb that averaged 11.5% with a few sections over 20%. While it was a very tactical race for the first 71.5 miles, the final miles were rider vs. hill, a matter of power-to-weight ratios and pure climbing ability. Willing was able to save his energy all day due to the strong work of his teammates helping to bring back a two man break that hammered out a 3 minute advantage at the halfway point. Willing arrived at the final climb fresh and followed an attack at the base of the climb by Lees-McRae’s Eric Thompson and then powered by him to claim his first collegiate victory in convincing fashion by 38 seconds over Thompson who finished 2nd. Peter Haile (LMC) was 3rd, Corey Meyer (Brevard) 4th, and MHC’s Paul Webb finished a strong 5th. Kyle Knott, our designated sprinter, had a very strong ride to finish 11th. Other strong results over the weekend include Klara Rossouw’s 1st place in the individual time trial, Paul Webb’s 2nd in the time trial, and Webb’s 3rd in the criterium. Our plan to set up Knott for another criterium win came apart on the last lap when he was unable to find Webb’s wheel for the planned lead-out, leaving Webb alone at the front of the field through the last corner. Other results include Knott’s 7th in the criterium, Rossouw and Yolanda Colon’s consistent top tens in both the road race and criterium, and Yonatan Arnold’s 7th in the road race and 5th in the time trial. Both the men and the women won their respective team classifications for the event as well. Heading into this weekend’s Conference Championships (hosted by Mars Hill), the team has already earned enough points to clinch the overall Division II team title. Rossouw continues to lead all women in the individual rankings, and Paul Webb once again leads all men in the individual rankings. The team also leads the rankings for nationals qualification. But with double points on the line at Conference Championship, the team will have its work cut out to defend those leads. We look forward to some exciting racing at Conference Championships this weekend. Big thanks to our hosts in Hunstville, Clinton and Vida Mann, who really went out of their way to make our trip to Alabama stress free. And thanks as always to the team’s sponsors and supporters.